The referendums on self-rule held in Ukraine’s southeast on Sunday, in which the Donetsk and Lugansk regions voted in favor of sovereignty, were met with caution by the Kremlin. 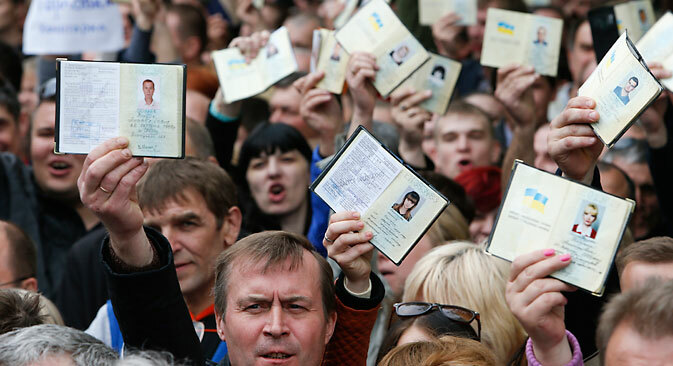 Meanwhile, Kiev has threatened the organizers of the vote with criminal charges. Official recognition of the new republics by Moscow is not on the cards yet, say experts. The referendums on self-rule held in Ukraine’s eastern Donetsk and Lugansk regions on Sunday, May 11, in which the local population voted overwhelmingly in favor of sovereignty, have met with a measured response from the Kremlin, which, while recognizing the implications of the vote, made a renewed call for dialogue between the regions and the caretaker government in Kiev. Moscow “respects the will of the populations of the Donetsk and Lugansk regions,”according to a public statement released by the press service of the President of Russia on Monday. The results of the two hastily arranged referendums, in which 90 percent and 96 percent respectively voted for sovereignty in Donetsk and Lugansk, were dismissed by the West as illegitimate, while Acting Ukrainian President Oleksandr Turchynov described the vote as a "farce” and said it would “have no legal consequences except the criminal responsibility for its organisers." On Monday, the two regions made a formal request to Russia to consider their incorporation into the Russian Federation. At the time of writing, Moscow had made no response to the request. Member of the Presidential Human Rights Council (HRC), Maxim Shevchenko, who observed the voting in the cities of Slavyansk and Kramatorsk, explained that the goal of the residents of south-eastern Ukraine is to be ruled by their own elected representatives, and not by people imposed from “above”. Observers note that Moscow is using the referendum as a reason to once again urge Kiev to begin communicating with representatives of the country’s southeast. “In the interests of establishing such a dialogue, we welcome any mediation efforts, including through the OSCE,” said the president’s press service. We should recall that Kiev has accepted the OSCE proposal to appoint German diplomat Wolfgang Ischinger, from the OSCE, as a moderator in internal Ukrainian dialogue. Meanwhile, Russian Foreign Minister SergeiLavrov, speaking at a press conference on May 12, said that any talk about a “Geneva2” international meeting on Ukraine ismeaningless without the participation of the southeast. “For now, no new meetings on Ukraine are planned, yet we would like to see efforts continue, not be blocked by anyone, and materialize quickly into some kind of process. Once again, getting together in the quadripartite format is not very promising,” said Lavrov. “Nothing will be achieved without the opponents of the regime becoming involved in a direct dialogue on resolving this crisis. This is also recognized by my colleagues, including U.S. Secretary of State John Kerry and German Foreign Minister Frank-Walter Steinmeier, who advocate that the Geneva principles be moved onto a path of direct dialogue between the Ukrainian parties,” said Lavrov. The Kremlin must not aggravate the situation now, but to follow the lead of Western politicians is also not reasonable, says Doctor of Political Sciences, Professor SergeiChernyakhovsky. RostislavIshchenko, a Ukrainian political analyst and president of the Center for System Analysis and Forecasting, believes that no particular reaction should be expected from Kiev. “Kiev keeps claiming that the southeast is full of Russian troops, terrorists imported from Russia, etc. They will continue to fight and keep blaming Russia. Nothing will change, and things will go on as before, because in this situation, Kiev is not an independent player. The United States is the independent player. Until the U.S. position changes, the position of Kiev will not change,” said Ishchenko. Based on material published by Gazeta.ru, Kommersant, ITAR-TASS and RIA Novosti.